Over millennia, fire and fumes have belched destruction from the navel of the Earth, while her boundless sea has nurtured but also inundated cities of elegance and luxury. To walk among the ghosts of oracles, centurions and prophets, where destiny has shaped history — and to do this from one of the world’s most exclusive motor yachts — is the cruise experience of a lifetime. Rome had been a baptism of fire, with searing heat sending us hopping from shadow to shadow under spindly trees, before swooning into cool trattorias. It was still 41 degrees Celsius as we slipped past the palisades and towers of Civitavecchia aboard SeaDream towards barren islands and hillside towns that would further test our endurance. On our floating oasis, we would immerse ourselves in the lives and deaths of classical civilisations that had withered under the breath of the gods. We anchored off Taormina, Sicily, among the cones and craters that clustered under the shrouded 3296-metre peak of Mt Etna. Lunch on the after-deck was accompanied by an impressive display of forked lightning, in the midst of which a chancing parasailor flirted with fire on the end of a string into heaven’s tympani. Next on the menu was picture-perfect Monopoli. SeaDream docked close to the beautifully-preserved old town, its church domes, archways and steeples beckoning us to explore the narrow streets lined with whitewashed buildings sparkling in the hot sun. We chose Osteria Pricci, a century-old, family-run trattoria where we enjoyed fresh, simple, authentic local seafood and olives. Out in the glare of the square, we licked gelato cones of lemon and basil, mango and pink pepper, and ricotta with fig. Later came Kotor, the capital of Montenegro. The walled town is at the end of a long fiord, finally accessed through a rocky passage 300 metres wide. In the Middle Ages, invading Ottoman ships were scuppered by chains across this gap. From the sea, high, protecting stone walls rose steeply up the cliff backdrop to safely girdle the town. Passengers from five cruise ships braved the heat and the persistent wasps to spill into shaded outdoor cafés and soak up free Wi-Fi under mist-spraying fans. We raised a cold beer to cruise director, Hayden McFarlane, who, with scoutmaster enthusiasm, had offered to lead a 2-hour walk uphill to Castel St John. The mercury was bubbling past 40 degrees again and he had few takers. The underworld was getting closer. A brief stop at Parga allowed guests to paddle in the porch of Hades — in the River Styx, or Acheron, as it is known today. Others revved up water sports toys, or simply swam from the aft marina platform. The ruins of mountaintop temples and ancient treasuries shimmer in the haze at Delphi, Greece. Photo by Michael Hooper. 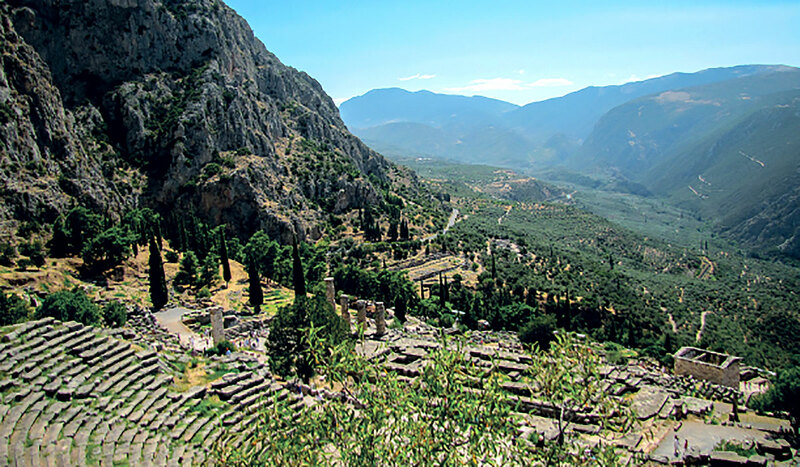 From the port of Itea, buses and taxis crawled up folding hills, past huge olive groves — windblown leaves flashing silver — to take tourists to Delphi. Pencil-sharp cypress trees punctuated the land like darts dropped by the gods, and oleander fringed the hairpin road up to the breathtaking museum of preserved statues, and the 5th century B.C. omphalos, the stone beehive-shaped ‘navel of the Earth’. The Oracle at Delphi was, quite likely, one of the world’s greatest con jobs. Kingdoms were won and lost following the advice of Pythia, ‘the Oracle’, whose mystic babble was interpreted by her priestesses. Science has since discovered that the holed stone on which she sat actually did have a direct connection with the breath of the gods — specifically the hallucinogenic gases, including methane, which rose through the fissure. The career path became quite short: after the first Pythia succumbed, replacements were slipped in. Despite the heat radiating from rocks, fascination with the myth led me up further to the Temple of Apollo. Finely chiselled into the blocks on its lower wall were the names of 8000 slaves whose freedom was proven only when ‘written in stone’. Now cats on a hot stone roof prance nimbly from relic to relic and lounge on antiquity, as visitors paw their way over the ruins. That evening, as the sun set reddish-gold, we approached the Corinth Canal, a 6.4-kilometre channel connecting the Gulf of Corinth with the Aegean Sea. When ancient emperors (including Julius Caesar and Caligula) dictated that it would be dug, there were fears that the water would flood from one ocean to the other. The project finally began when Nero set 6000 slaves to work in the 1st century A.D. Just over 21 metres wide, the canal does not accommodate many modern vessels, but SeaDream was towed through in almost reverent silence. The thin channel of sea separating the slices of rock rising either side reminded me of a sandcastle moat as we emerged to approach Hydra. Donkeys are the island’s mode of transport and the SeaDream tender landed at the feet of Diva and Amazon, a pair waiting patiently to clomp up the arid hills. We chose a stylish restaurant 5 minutes’ walk along the sea wall, with white tables — each punctuated by a sole Spartan lemon — set against the amethyst blue of the Aegean. Under shade umbrellas, with local wine poured, we watched Hydriots pass by in the sweltering sun. The Library of Celsus at Ephesus, erected 135 B.C. Photo by Chris Swannell. 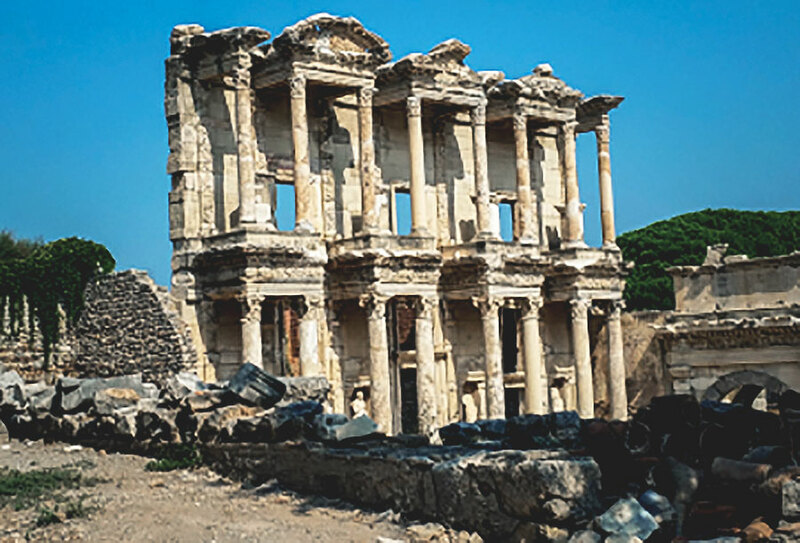 From the Turkish port of Kuşadasi, I found my cruise highlight — a ‘land adventure’ to Ephesus. St Paul wrote his letter to the Ephesians 2000 years ago, and so well preserved and restored are the streets, temples and houses, that I was easily transported back. Excavations are now revealing marvellous mosaics, sophisticated plumbing, central heating and sewerage, and enabling visitors to walk through houses equipped with everything but the internet. The roof of one property forms the terrace of another above as they stretch up the hill opposite the Temple of Hadrian. 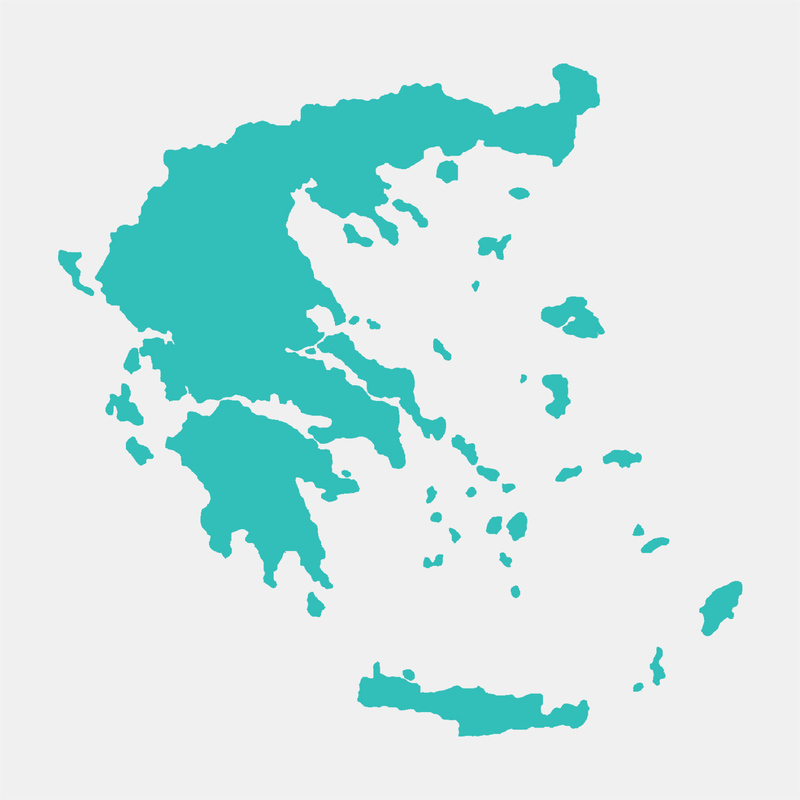 The city of a quarter of a million and the birthplace of democracy finally came to an end when the River Meander and the port silted up and Earth had the final say. Now cats on a hot stone roof prance nimbly from relic to relic and lounge on antiquity, as visitors paw their way over the ruins. 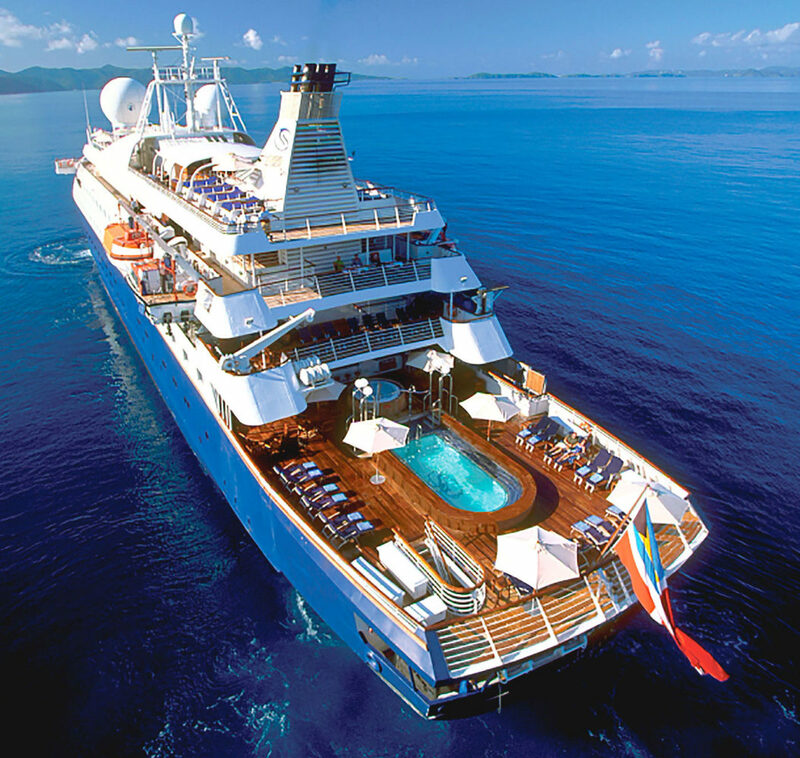 SeaDream is authentic, and while expensive, nothing is charged onboard except internet and excursions. She can dock at small ports, queues don’t exist, and there’s always a crew member nearby who knows one’s personal tastes. With just 91 passengers, she feels more like a large home, where staff outnumber guests. That meant cool towels and cold water were always at hand for those slogging up the gangway, while tents were set up to offer shade in ports of call. Sitting at the captain’s table, overlooking the pool deck one balmy eve, with just five guests, Master Bjame Smorawski epitomised the bespoke nature of SeaDream. An understated seaman, with 53 years on deck and a dry Scandinavian humour, he relaxed in crisp, short-sleeved whites. He chuckled about the time he chose to stop mid-Atlantic for guests to swim. “We told them later that the water was 10,000 metres deep.” Now that is very cool.